The past weeks were just simply horrible. Despite the pain, I continue to be crazily busy. First trying to get the maid to help out, and ignoring her foul mood. I was desperately trying so hard to get all things settled down so that I can release her as soon as possible. Not only the pain was affecting my whole well being, having to put up with all her nonsense makes matter worse. Finally the day came for her to go. I was in for more shock. After done with all the release paperwork, I found more money on her all wrapped in tissue and plastic, tucked in the same pair of shoes that I already found our missing foreign currencies! Unbelieveable to think that she has more hidding place till she thought was safe to "smuggle" it out. Though it is not much but the thoughts of having a thief under our roof all these while irked me. I regretted not calling in the police. Then again, we couldn't as we have another important appointment to attend after dropping her off to the agency. I couldn't sleep that night. I should have filed a police report so that she won't be able to come in the fourth time and cause so much stress to future employers. Yes, I found out that I was actually her third employer, she broke all previous contracts and I, was the her longest serving employer! One of them even as short as three months. Aren't we, Singaporean employers the victim of irresponsible workers who takes us for a ride. We paid money, spent time training them and letting them share our life. In the end, these are what we gotten. Who gives a thought for us? Thinking about my fellow countrymen and seriously didn't want them to go through what I went through. Finally, I wrote to MOM and tell them about my experience. Let's hope they will take serious view to such workers and be more selective when issuing work permit. I hope our government will see our plight too, it is not always the maid is right or the victim. Anyway, my new maid came onboard last night. Yes right after my KL trip to support my kiddos' taekwondo competition, I was frantically clearing all the laundry, vacumming and tidying. Wanting to set the right standard and to hand over a clean house for the new maid. I was on a breakdown as my teen was slacking around the house and I, slogging away as if I was invisible. I question his upbringing, what on earth had I done to raise such terrible son. One who only cares about himself and his PSP. As for the new helper, I didn't get to pick her up till 15 mins before the agency closing time because I just couldn't complete all the task. Luckily hubby came home early and insisted that son repacked his wardrobe. Sometime I wonder what is the point of washing, folding and ironing when everything just dumped into one pathetic pile in the end. The new maid looks gentle and seems to have the right attitude. I pray that she will honour her contract and able to live happily with my family. She is a smart girl and let's hope she will pick things up quickly. Then I can really slow down, relax and recuperate fully. Oh the pain is slowly easing off. I am seeking chinese medical treatment and it is definitely helping. I still need to watch my posture though but at least now I can sit for half hour with ease. To welcome myself back to the blogging world. I couldn't resist Honey Bee Sweets's cheesy waffle bites. After all, it looks simple! As what HBS suggested, I done a double batch and up my cheese to 80g. Still I finds it not cheesy enough and added some grated cheddar cheese. My girl and I have a great time. It's sure been a while since I last "baked" with my princess. The texture is cookie like. The smell is awesome when it is cooking. Something new and very easy to prepare. I also shared this with my classmates whom I met in the evening. All loved it. Stir well to form a soft pitiable dough. Divide the dough into small ball portions of about 1.5cm diameter. Cook till golden brown in the waffle maker. Hope you're enjoyng the evening. My hubby wants to get a maid too, but I dread it. So he has to put up with whatever the state of the house is in, LOL. i shared the same sentiments as you on the maid problems.My son also hooked with his PSP, though he is only 11!I supposed being parents nowadays need to be very patient and has to play many roles of mentor,guardian and friend in their process of growing up.I would say you are a great mum despite all the challenges. Thanks HBS. After taking the chinese medication, I am much better but still need to keep the movement slow. Kristy, I have no maid luck. All very unappreciative. I can't imagine how I can deal with a preggie maid. You have a good week ahead too. Wendy, if I can live without one. I won't want one coz for 5 years. Though physically tired but I was happy. At least no one to destroy what I had built. My set of fine cultery now all have missing pieces. A set that I can never replace anymore coz the quality now all different. Sem, thanks for dropping by. These gadgets are terrible. It creates anti socialism in kids! I now warn my friends with young kids, never to give them one coz it will destory their life. Glad to know that you are feeling better.Pray that God will strengthen you. Hope everything will work out fine with the new helper. Take care of yourself! 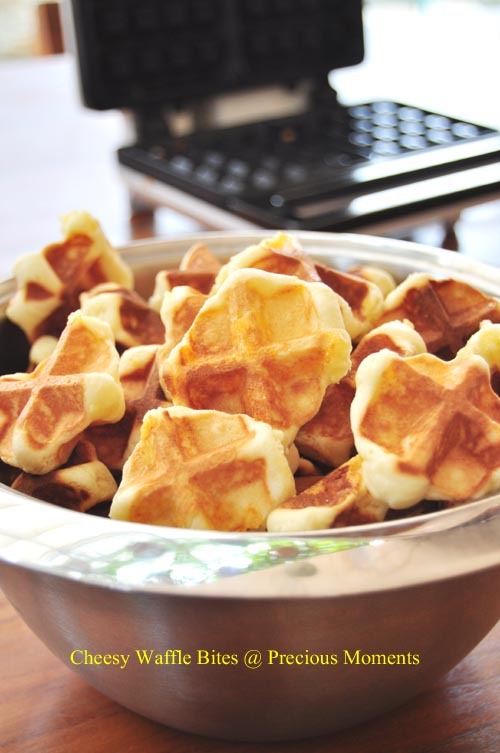 The cheezy bites looks wonderful, I need to get a waffle maker! hope you're feeling much better now. And the mini waffles look very inviting. Thanks for sharing (and thanks to HBS too). hi edith, hope that your new maid doesnt give you much problems and time will tell. I'm glad that you are still finding time to bake, happy day to you! Thanks Elaine for your prayer. Kitchen Flavour, yah I pray this one works too. Tina, I was glad that the bad one finally out of my life. Let's pray the new one has good attitude. PM, thanks for the advice. MOM responded to my letter and advise me to file a police report. The inspector wanted us to file a case against her instead so that they will arrest her if she step into singapore again. Given that she was already here three times! Hope you are feeling better now. If it's any consolation. I had a helper who stole my gold and 1k plus of cash. To avoid suspicion, she hid the loot in my store room in my kid's bag containing a skate board. When confronted she said that she had just thrown all into main rubbish chute. We went to check togethe with our apartment guard and nothing there. She was so calm and acted so well, rummaging through half bin of rubbish in the main chute bin. Left with no chice, brought her to agent and through body search found the stash of cash and whole bag of gold. All hidden beneath her bra. Agent had indifferent attitude and told me I had to deal with police myself. Alternatively, as her loan had not been fully repaid (4 mths with me) i could still transfer her to another employer.! She said that this is a common practice as employers don't want to forego loan repayments. Greatest shock was when i brought her to the police station and they told me that I can prosecute her as amount is big but while waiting for case to be investigated and heard, i still had to bring her home. As i wanted a clear conscience and the fact that I cannot bring myself to transfer a thief to another employer, i had no choice but to send her home. I had to forgo 4 months of her loan, pay for her temporary housing at agency while waiting for next flight out, pay her air ticket and not to mention incurring additional cost to bring in new helper! I had blacklisted her but was told nothing much as they can come in using different identity. Hi Anonymous, wow your experience is really horrific. I will be waking up in nightmares for month if I were you. Thanks for sharing your experience.